Have you watched the “Extreme Shepherding” video that has become so popular in the past few days? Take a look…..
Every time I watch that video I’m amazed. And, I can’t help but think of the first “Extreme Shepherding” that occurred in the first-century. It didn’t involve LED lights, video cameras or any other technology, but I can imagine the sight was even more impressive. Read what Luke recorded in his gospel about the experience. There are so many great take-aways from the shepherds’ story. Lessons of openness to unexpected messages, of responding with immediate obedience, of excitedly sharing truth, and of worshiping unashamedly. One also cannot overlook the improbability of Jesus’ birth announcement being first delivered to some of the lowest, poorest individuals in society or the significance of a large, singing choir of angels, or their proclamation of peace. But more than anything the simple statement, “Seeing was believing” stands out to me. At first glance the statement appears exclusionary because after all, we weren’t there, we didn’t see, so however can we believe? But I think we’re intended to think about it quite differently. While we weren’t present at the manger on that first Christmas morning, we are continually offered glimpses of “God sightings” that can move us to belief. * Brilliant colors painted across the horizon as the sun sets in the west. * A child who spends his own allowance to buy a blanket for the man standing on the corner with a cardboard sign. 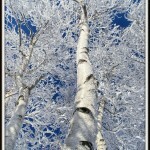 * Hoarfrost shimmering on a tree branch in the early dawn’s light. * The encouragement of an unexpected phone call “just to say Hi” on a day when it’s most needed. 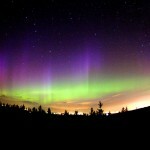 * Dancing lights in the northern night sky. * True tales of selfless heroes and guardians of justice and hope. Perhaps you judge these things as insignificant, especially compared to seeing the King of Kings and Lord of Lords majestically lying atop a mound of hay in a manger. But really the scene the shepherds saw was hardly majestic. They rejoiced and believed simply because they found what they had been told to look for. Like the disciples who saw and believed, we too can believe when we see what we’ve been told to look for – beauty, purity, wisdom, and self-giving love. Now that’s “Extreme Shepherding”! Where have you seen and believed this Christmas season? How do you plan on doing your own “Extreme Shepherding” this season?